A new coat of interior paint is a simple home improvement option that can do wonders for any room. While picking the right paint color for your interior walls and trim is important, the interior paint finish you choose is also critical to a long-lasting, visually-appealing paint job. Many people think that all interior paint finishes are meant to be used on walls, but that couldn’t be further from the truth. Paint sheen makes a huge difference in terms of both durability and aesthetics. If you’re unsure what type of sheen to use for your interior painting project, the following tips can help you choose the best interior paint finishes for every room and surface in your home. Before you decide on the best paint finish for your home interior, it’s important to first understand what each type of paint finish brings to the table. Paint manufacturers use many names to describe interior paint finishes from flat and matte, to eggshell and satin, to low-luster, semi-gloss, gloss, and high-gloss. It can be enough to make any homeowner’s head spin! The good news is you can usually categorize interior paint sheens into just four categories: matte, low-sheen, semi-gloss, and high-gloss. Matte Paint: Matte, or flat paint finishes, add richness to paint color and can hide minor surface imperfections. This type of paint is easy to touch up, but it’s porous nature also absorbs stains which means it can be very hard to clean. It should be noted that flat paint (what builders also use) is often being coated over with eggshell, see below for more info on this transition that homeowners are making. Low-Sheen Paints: Eggshell is a mix between flat and satin. Not too shiny and not too dull. It is one of the most popular sheens. Satin are about double the sheen of eggshell. Low-sheen paints are less porous than flat paints and can easily be wiped down. Because this finish is neither flat or shiny, it gives off a beautiful and understated glow. Semi-Gloss Paint: This durable interior paint finish reflects a lot of light and is easy to clean, making it ideal for accentuating woodwork and painting moisture-prone rooms. High-Gloss Paint: High-gloss, gloss, and extra gloss paints are the most durable of all of the paint finishes. Thanks to the non-porous finish, they’re extremely easy to wipe clean. High-gloss sheens are ideal for painting trim, doors and windows that get a lot of wear and tear. Because living rooms have low to moderate foot traffic, there are two good choices of finishes for interior wall painting: flat/matte sheen or low-sheen. Going with flat will provide a sophisticated, subtle finish and hide minor imperfections. Opting for an eggshell or satin finish in your living room will provide your space with a soft, velvety look and offer you the ability to wash the walls — an ideal choice if you have small children. If you want a softer, calming look in your bedroom a flat paint sheen is ideal. However, low-sheen or eggshell finishes will reflect a tiny amount of light and add a more stylish touch to bedroom walls. It’s important to note that both of these finishes should be reserved for low-traffic or adult bedrooms. As for children’s bedrooms, look to a satin paint sheen for walls. Satin paints are durable enough to stand up to more active rooms such as children’s bedrooms and playrooms and can be wiped and scrubbed clean with ease. Bathrooms are prone to dirt, grime, and moisture. Because this high-traffic room requires frequent washing, choosing a satin sheen is best if you want to be able to scrub and clean bathroom surfaces. Use semi-gloss on walls, trim, and even bathroom ceilings to repel moisture. Semi-gloss is encouraged when you have a shower with little air ventilation. Paint Finish Tip! Low-sheen or eggshell paint finishes can also be great options for bathrooms that don’t get much use such as a guest or half bath. Kitchens are the heart of the home — a place where families gather and spend a lot of time. So, when it comes to your kitchen, durable and washable paint sheens are best. Low-sheen or semi-gloss paints will not only look great in a kitchen, but will also provide you the ability to soap up the walls when they get grimy. When it comes to kitchen cabinets, the harder the finish, the better. Try to stay away from matte or flat sheens on cabinets because you want a surface that is durable and easy to clean. A semi-gloss or gloss finish on kitchen cabinets will make them stand out and stand up to scrubbing. Factory finishes on cabinets usually come in a harder finish, so take note! If you have a ceiling painting project on your hands, a flat or matte latex paint is ideal if you have a textured or “popcorn” ceiling. Flat paint also hides flaws on ceilings extremely well. Eggshell paint finishes are also rarely used on flat ceilings to deliver a slight sheen. Paint Finish Tip! One exception to this rule is your bathroom ceiling with a shower. Semi-gloss sheens are ideal for bathrooms as they help repel moisture. Hallways and foyers are high-traffic areas that need to be protected. With so many people going through them each day including small children and pets, they can easily become dirty from all of the bumping and touching. This is why eggshell paint is ideal for these walls. However, foyers are usually big drywall spaces with lots of light. If you are worried about seeing imperfections in the walls, a flat paint is the way to go. Trim inside your home is meant to stand out from the walls. This is why it’s best to choose either a semi-gloss or high-gloss finish for trim painting such as window frames, doors, baseboards, and other woodwork. A good rule of thumb is to paint your trim at least two jumps away from your wall sheen. This means that if your walls have an eggshell finish, use at least a semi-gloss on your trim. For walls that are already painted in a semi-gloss (such as your main bathroom), a high-gloss for the trim would be ideal. 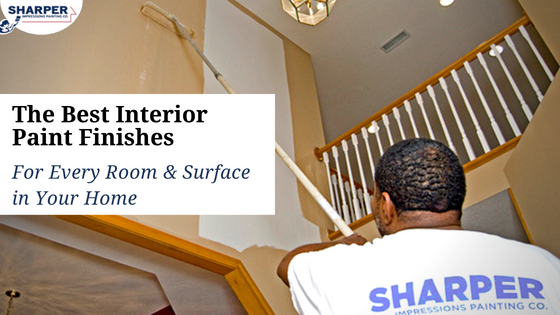 Professional interior painters have the knowledge, tools, and equipment to paint any room or surface in your home. At Sharper Impressions, we listen to the vision you have for your space and deliver eye-catching results in the right paint sheen to ensure the paint lasts longer and looks great for many years. Get your free interior painting quote today. And don’t forget to ask about our in-home paint color consultations to help you choose the perfect paint finish!